The Branch County Flying Club is a local non-profit club that promotes and enjoys aviation in the Coldwater area. Elite Air Service supports the Branch County Flying Club through the donation of this web page and the yearly donation of the free use of the Elite Air Hangar for the Flying Clubs Annual Pancake Breakfast that provides scholarships to local graduates seeking a career in aviation. When are the club meetings? Club meetings are held once a month at 6:30pm on the first Thursday of each month. Check the Events Schedule for the next club meeting dates. Where are the club meetings? Club meetings are held at the Branch County Airport Admin building on Airport Road on the north side of the Branch County Airport just west of Coldwater. Club members get together for a pot luck dinner, a club business meeting and socializing about airplanes and flying events. How long does the meetings last? Meetings usually last 1-1/2 to 2 hours. Members will sometimes meet for pie and ice cream at a coffee shop after the meeting. What do I need to bring to the meetings? Bring a plate, some silverware and a drink so you can enjoy the food. Most members will bring a passing dish. I don’t own an airplane and/or I haven’t learned to fly yet? Owning an aircraft or having a pilot license is not a requirement to be part of the club. All individuals interested in aircraft and flying events are welcome. Club dues are $10 per year per household. What if I can’t make it to all twelve months meetings every year? Many club members have conflicting schedules sometimes. There is no requirement to attend all meetings. Are there flying activities that club members participate in? Yes, Young Eagle events several times per year. Pilots donate flying time to provide youngsters with their first flight. The club organizes a fly-in breakfast every June. 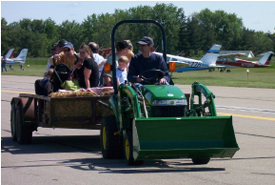 The club organizes a fly-in and camp corn roast in the fall. We are also trying to organize group flyouts to other airports flying events. The EAA Young Eagles program was launched in 1992 to give interested young people an opportunity to go flying in a general aviation airplane. These flights are offered free of charge and are made possible through the generosity of EAA member volunteers. First of all, your pilot will explain what will happen during the flight. This might include talking about the airplane; reviewing an aeronautical chart (or map); identifying reference points during the flight; completing a careful “walk around” preflight inspection of the airplane and identifying the parts that control the airplane. 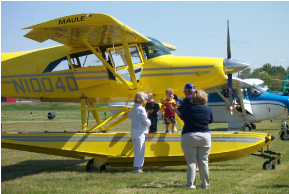 The Branch County Flying Club organizes Young Eagle flights at the Coldwater Airport several times every year. Check our “events calendar” to find out when the next scheduled Young Eagle flights will take place in Coldwater. 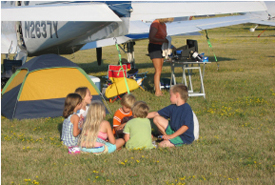 There are many other clubs that hold Young Eagle events at many other airports across the country. You can see a list of most of these events here. Since Young Eagles began in 1992, there have been three Chairmen. All are active pilots and have flown Young Eagles. The first chairman (1992- 1994) was Academy-Award winning actor Cliff Robertson. Mr. Robertson was followed by Gen. Chuck Yeager (1994 - 2003). Of course Gen. Yeager is known as a famous test and combat pilot and the first person to fly faster than the speed of sound. Now, Harrison Ford has taken over for Gen. Yeager. “It’s daunting to step into General Yeager’s shoes, but aviation is about learning new skills and the satisfaction that comes with practicing them and doing better,” Mr. Ford said upon accepting the position. Mr. Ford earned his pilot’s certificate in 1996 and joined EAA. Since then he has also earned several additional ratings including seaplane, rotorcraft (helicopters) and an instrument rating. He also owns several aircraft including a deHavilland Beaver and Bell helicopter. As Chairman, Mr. Ford promotes the EAA Young Eagles program when possible and plans to attend the EAA AirVenture Oshkosh Fly-In. Mr. Ford has flown nearly 200 Young Eagles since becoming involved in the program in 2001.